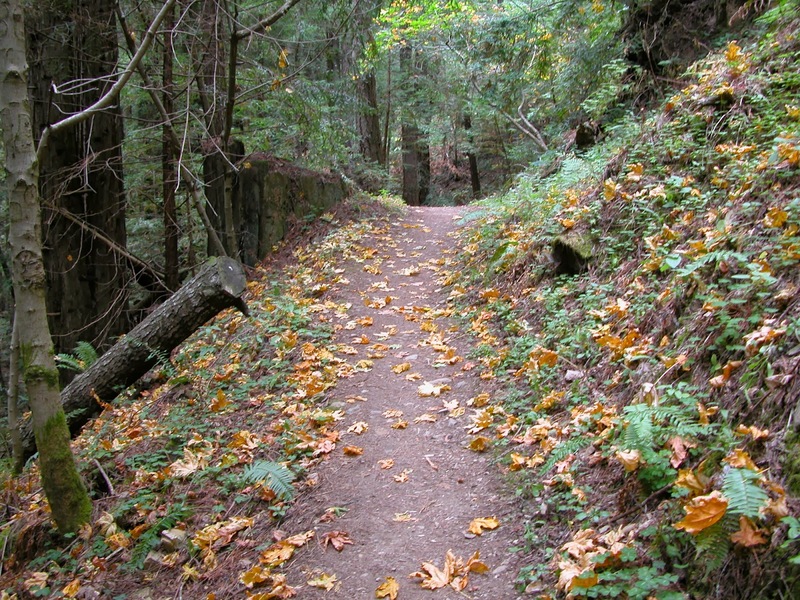 Bigleaf maple leaves litter the trails at Purisima Creek Redwoods this month. This one's a seven mile loop through redwood-stuffed canyons south of Half Moon Bay. Look for colorful orange leaves on bigleaf maples while trekking on mostly-shaded and well-graded paths. As long as trails aren't too muddy, this is an incredible winter hike. Spring is lovely too, with a variety of wildflowers in the woods and chaparral. Beware of the Halloween pumpkin-seeking hoards, who descend into Half Moon Bay this time of year. If you're planning a visit to Purisima Creek on a weekend, consider starting this hike from the Skyline Boulevard trailhead. Purisima Creek Redwoods is hike 48 in 60 Hikes in 60 Miles: San Francisco (third edition). Read about this hike on BAHiker. Joaquin Miller Park is a little-known redwood enclave, in Oakland! Post your comments here or on the BAHiker Facebook page.